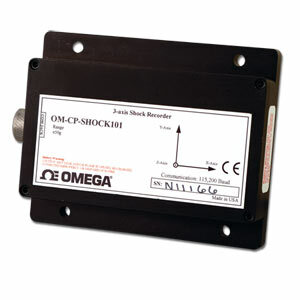 The OM-CP-SHOCK101 is a battery powered, stand-alone 3-axis shock data logger that measures and records shock levels. These compact, economical units have built-in accelerometers to measure dynamic and static acceleration, and may be used in a wide variety of applications, including assembly line monitoring, fragility testing, drop testing and other machinery monitoring. The OM-CP-SHOCK101 records the peak acceleration levels over user defined intervals, with a software selectable reading rate from 64 per sec to every 5 minutes. The sample rate is 1.953 ms/512 Hz. The OM-CP-SHOCK101 can store up to 349,000 measurements per axis, and hold them in non-volatile solid-state memory, even when the battery is discharged. Data retrieval is quick and easy-simply plug in to a COM or USB port. The OM-CP-IFC software displays your data in an easy to use graph, so you can analyze your data quickly. A variety of powerful tools allow you to examine, export and print professional looking data with just a click of the mouse. 참고: Operator's manual and USB interface cable are included with the OM-CP-IFC200 Windows software (required to operate the data logger and sold separately).